Having an effective email compliance policy is necessary for every organization to demonstrate and ensure that the business is operating in a compliant manner and to minimize ongoing legal risk. Are you sure if your daily corporate email communication is covered by email compliance laws and regulations?? A solid Email compliance policy can help organizations get rid of common phishing, malware attacks, and leaky emails to secure intellectual property, prevent harassment and protect the corporate brand. 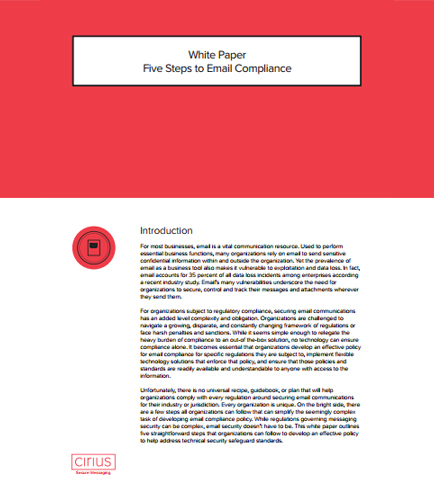 This white paper outlines five straightforward steps that organizations can follow to develop an effective email compliance policy to help address technical security safeguard standards.